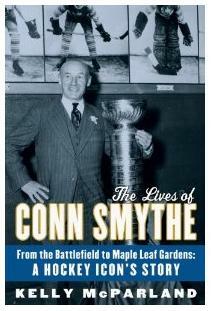 Kelly McParland, writer, editor and columnist at the National Post, has penned just a fantastic biography of Toronto Maple Leafs builder and Canadian hero Conn Smythe in his new book, The Lives of Conn Smythe: From the Battlefield to Maple Leaf Gardens: A Hockey Icon's Story . Smythe is of course known as the patriarch of the Toronto Maple Leafs. He led them to 11 Stanley Cups, and with a little better luck in the 1930s it would have been a lot more. Maybe Smythe used up his luck in that time period by, as legend tells it, using gambling money to build iconic Maple Leaf Gardens in the depths of the Great Depression. Those stories have been well told. But McParland digs deeper, and looks at decorated war hero (he fought in both World Wars, including in WWII when he was in his 40s) and savvy businessman who did more for nation building than most of our politicians ever have. In short he is a fascinating Canadian hero who should be known for much more than his contributions to hockey. Not only was he a proud Canadian, but a self-made one. He built himself from nothing into one of the most powerful men in the nation, not just in hockey. He may have been popular, but he was also loud, outspoken and controversial, but always quotable. Think of him as a cross between Brian Burke and Don Cherry in his day. He was not afraid to speak his mind. He was a like-him or love-him type. He didn't care as long as he was generating interest. McParlad also paints Smythe as a very contradictory man, hence the title. For everything he was, there was always another side. He demanded full loyalty, whether it be on the ice or on the battlefield, but he did not always return that loyalty. He held some people to the highest standards, but not others. He often made boisterous claims, which were later proven to be inaccurate. All in all this is a fascinating, in depth, almost academic read where you learn something new with great regularity. You quickly realize that this is more than just a hockey book. It is a book about Canada, and it is a book about a great Canadian hero in more way than one.